This week has been really hectic as things have diverted oh just a few dozens times on me and as such I did not get to bake any bread. Although at the beginning of the week I was super ambitious planning to bake the first GF bread for Alice, some sort of white sourdough to bring to the mountain for David and a crusty white loaf like Sesame Semolina Filone for my high school teacher –whom I am going to visit this evening– and none of these has taken place. Oh well, one of such week! As I am going to head out to the mountains tomorrow’ early morning and no bread baked for the week, I am going to post about this brioche that I created a while back. 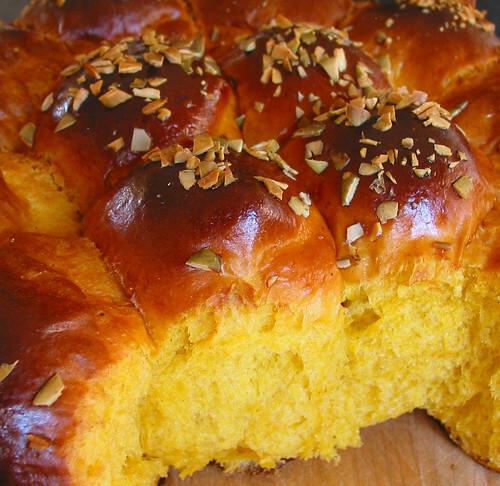 The recipe is Susan’s Wild Yeast’s Butternut Brioche with my substitution of roasted kabocha squash because that’s what I had in my kitchen. I am a big fan of freshly ground nutmeg so used it as spice and am glad I did because the spice goes really well with kabocha. 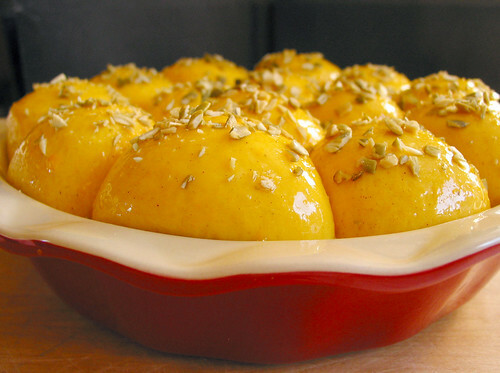 You do need a mixer to mix the dough to reach well-gluten development stage before adding the fat –butter in this case–. I used instant yeast and it worked fine. 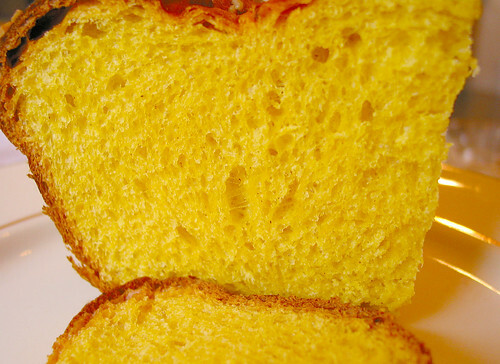 This bread is so very easy to make and very tasty; the squash flavor is indeed very front and center as commented on Susan’s blog. I mixed the dough in the evening, let it go through a cold fermentation in the fridge and shaped in the early morning. The second rise was long enough to allow me back to bed for a quick nap then freshly return to the kitchen to beautiful risen loaf. Within the next hour or so voilà warm rich brioche for breakfast. 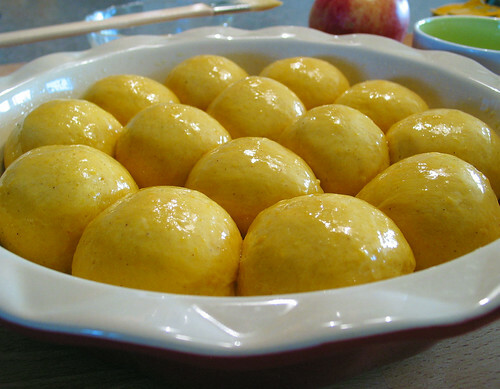 The dough got its natural color from the squash and it’s such a superficially yellow color that I hesitated to bite into it. But it’s beautiful, isn’t it? The recipe is straight forward, the dough is fun to play with just a tad sticky but very silky soft. So if you are equipped with a muscular mixer you are good to go. Thank you Susan for a beautiful recipe. I love rich brioche every now and then. Breakfast, lunch and snacks throughout the day. The bread freezes well –as long as you don’t put anything heavy on top of the frozen loaf–. 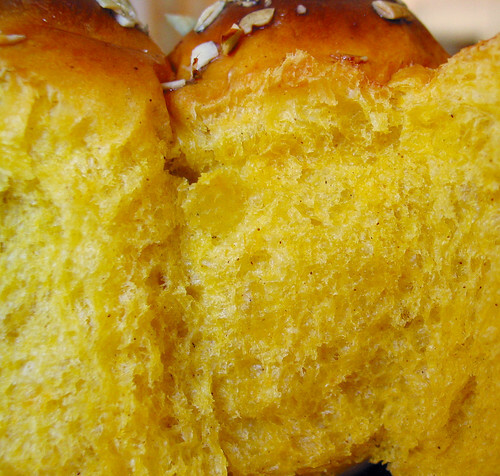 Enjoy this brioche for the weekend. I’ll be away but would not miss the party at Yeast Spotting to where I am sending this bread.